The festiveness of the holidays is upon us and it’s time to make a plan of attack. What to serve? How to serve it? What I am bringing where? And how the heck am I going to feed all these people? Anyway, I’m hardly the first one who thought of this but it’s a staple around here during the holiday season. This is one of those great, quick appetizers you make in a moments notice. 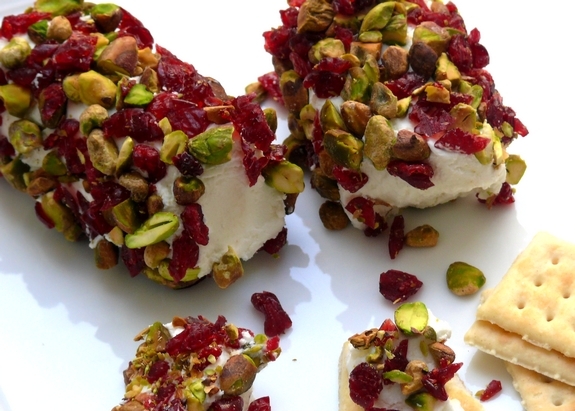 Stock your fridge with a few logs of goat cheese (it lasts a long time), some dried cranberries and shelled pistachios. The sweet cranberries, salty nuts and earthy taste of the goat cheese are a great combination. If you have unexpected guests, or have to work late before a party and don’t want to show up empty handed…this is perfect. Also, if you have to travel a long way and need something to hold up in the car….this works well. Even if you have planned every detail down to the millisecond, this is still the perfect appetizer to put out for your guests. I always think you should offer cold and hot apps for a party and the cold ones need to be easy so you can concentrate on cooking the others. Now, you can roll goat cheese in anything you like but this is by far very attractive looking on a platter. Your guests will love it. 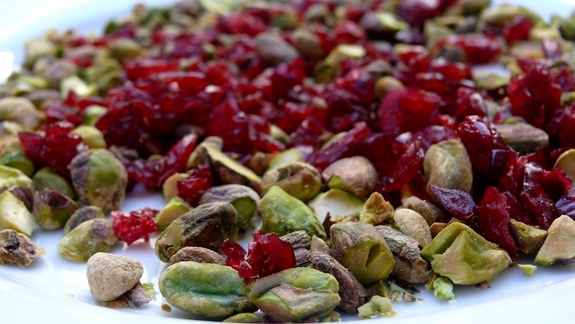 Coarsely chop your pistachios and cranberries and combine them together on a plate. Roll the goat cheese in the nut mixture, you will also have to press them in with your fingers. Coarsely chop your pistachios and cranberries and combine them together on a plate. Roll the goat cheese in the nut mixture, you will also have to press the mixture in with your fingers. olÃ¡!!parabÃ©ns! !pelo maravilhoso blog..da para sentir o amor e carinho,,obrigada!! !por partilhar! !sua fÃ£ do brasil!! And this will be on my holiday table! Oh, how pretty, Cathy! 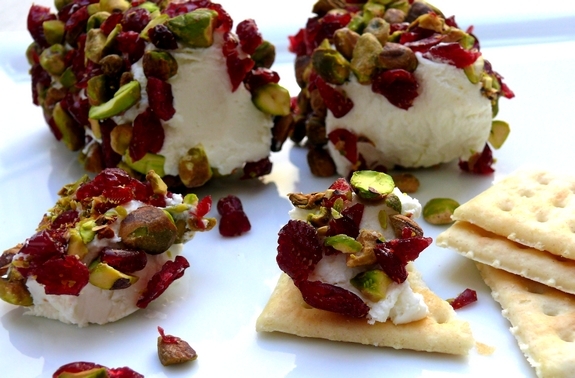 I love goat’s cheese, plus pistachios and cranberries. Yum! This looks so lovely and delicious, but I cannot stand the taste of goat cheese. I’ve tried many, many kinds and have never found one I could even pretend to like. But it is lovely! This is a splendid idea. I work in a grocery store and always work on Thanksgicing but want to bring something so this is perfect! yay, this will be my appetizer contribution to thanksgiving! delicious. Oh my goodness, Heaven on a cracker! This snack has all the right descriptive words…easy, stunning, delicious and perfect for holiday!!! Mind is I try it? it’s a favorite of ours now! going to make this as an app for my dinner party tomorrow. thanks for posting! You share so many wonderful recipes that I have found one for you. It will go wonderfully with your recent post. I used feta and almond…OH MY GOSH! This looks absolutely delicious!! I can’t wait to try it! This looks wonderful and I just know it will taste great too. Such a nice collection of colors too. Gorgeous! Great crunch factor and two tangy flavors to push onto a cracker… truly easy and terrific! I cannot wait to make this on Christmas Eve for the peoples! They are going to love this!! So festive! I make this for my Bible Study Christmas party last night and was a little hesitant to take it because I thought it might be just a little “much” for this group. When I went to help clean up and gather my dish, my plate was completely empty. I thought it was great and apparently, everyone else did also. It was so festive and pretty. Thanks for the idea.